The overall objective of the project was to build a strong EU-wide constituency for gender-sensitive and gender-responsive European development co-operation. Women’s organizations in new member states (NMS) generally have little experience in development cooperation. However, their input and advocacy actions are essential to support decision-makers, and other development actors to recognise how fundamental gender equality and women’s rights are to an effective and sustainable development cooperation. A strong East-West-South dialogue and exchange is needed to build EU-wide support for development co-operation and for putting women’s rights and gender equality at its centre. 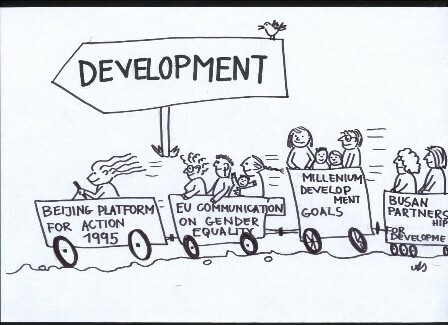 The project aimed at strengthening the capacity of women’s organizations from the countries that joined EU in 2004 and 2007 (Bulgaria, Czech Republic, Poland, Romania, Slovakia) to advocate for the full implementation of the EU Development Consensus and the EC Communication on Gender Equality and Women’s Empowerment in Development Cooperation. It also focused on strengthening the allies and solidarity between women’s organizations in Central- Eastern Europe and Global South. One World Action (UK, the leader), Gender Education Research and Technologies (Bulgaria), Association of Equal Opportunities & Gender Studies, O.P.S. (Czech Republic), ‘AUR’ – A.N.S.R.U (Romania) and Slovak Center for Communication and Development (Slovakia). The main activities included events such us: Regional Dialogues, National Dialogues, advocacy work and publications. More about the events HERE. Share the post "About the project"